FDA Regulatory Reference from C.H.I.P.S. Covering regulatory requirements stipulated by FDA and GAMP guidelines, Complete Guide to International Computer Validation Compliance for the Pharmaceutical Industry delineates the organization, planning, verification, and documentation activities and procedural controls required for compliance. Whether you need to validate computer systems for pharmaceutical cosmetic, food, or medical devise applications, this book is indispensable. Discussing the regulatory requirements that are the foundation for any project, the book introduces a model that can be used to determine the Part 11 requirements for consideration during implementation. The book establishes a top-down approach to the integration of computer systems validation strategies in support of a computer systems validation project. It focuses on practical issues in computer systems implementation and operational life project management, including relevant activities to comply with Part 11, validation planning, and scheduling. The book reviews documentation in relation to CSV and procedural controls in regulated operations. 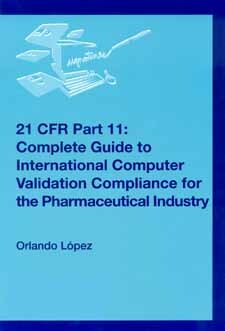 Complete Guide to International Computer Validation Compliance for the Pharmaceutical Industry shows how to enable compliance with computer systems validation requirements while highlighting and integrating Part 11 requirements into the entire computer validation program. The author places regulatory compliance within the context of quality assurance and emphasizes the importance of integrating validation into the system lifecycle using a structured top-down approach. This systematic approach helps you efficiently develop compliant software and maintenance its compliance. What is a Computer System Validation? Why Do We Validate Computer Systems? Which Systems Should be Validated?